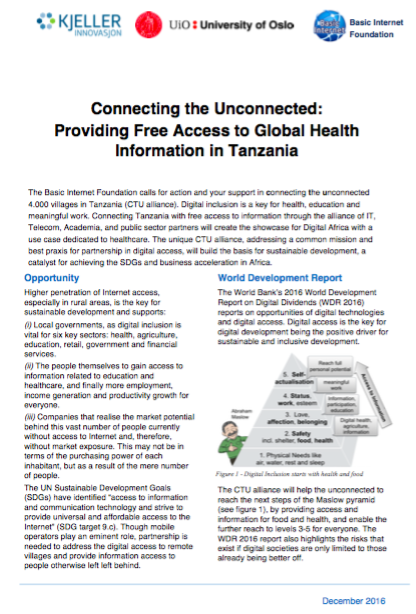 The Basic Internet Foundation calls for action and your support in connecting the unconnected 4.000 villages in Tanzania (CTU alliance). Digital inclusion is a key for health, education and meaningful work. Connecting Tanzania with free access to information through the alliance of IT, Telecom, Academia, and public sector partners will create the showcase for Digital Africa with a use case dedicated to healthcare. The unique CTU alliance, addressing a common mission and best praxis for partnership in digital access, will build the basis for sustainable development, a catalyst for achieving the SDGs and business acceleration in Africa. 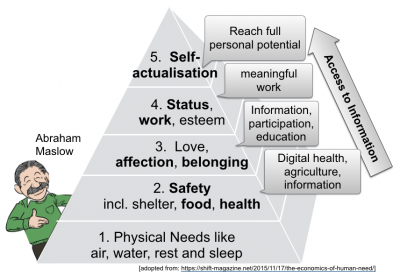 The CTU alliance will help the unconnected to reach the next steps of the Maslow pyramid (see figure 1), by providing access and information for food and health, and enable the further reach to levels 3-5 for everyone. The WDR 2016 report also highlights the risks that exist if digital societies are only limited to those already being better off. The CTU alliance takes the challenges to connect rural areas, and aims at creating the showcase for digital information access in Africa. The government of Tanzania is building the fibre infrastructure connecting the various regions, which is an excellent starting point of bringing Internet to the 4.000 unconnected villages. We envision information hot-spots with free access to information with sustainable business models, and the commercial roll-out of mobile networks for coverage. (i) Current trends show that smart phones are getting dominant, thus allowing users access to digital information if data access can be made affordable. (ii) Availability and affordability of data traffic. GSMA has pointed out that by the end of 2014 around 77% of the developing had no access to 3G/4G mobile networks. Though operators plan for cheaper networks with wider coverage, access to villages has to be ensured before mobile networks can be established. (iii) Addressing inequality, and especially the education of women and girls, who typically don’t have mobile broadband connectivity. (iv) Free access to information, starting with digital health, being the basis for further education. The free access gives those who have never used a value proposition prior to the commercial uptake of mobile Internet. (v) Establishing the base for commercial operations of Internet provision, mobile operations and digital job creation. People know the value of television, voice calling on phones, motor bikes, refrigerators, etc., but not of the Internet and the opportunities enabled by the digital society. Though appreciating the cultural and economic differences between regions, we believe that connecting the unconnected 4.000 villages in Tanzania will become the show-case for digital Africa. The collaboration between public authorities in connecting the regions, the joint effort of connecting the villages, and the duality in providing free access to information and commercial mobile/Internet access will become the catalyst for achieving the SDGs. With half of the World’s population growth taking place in Africa, digital Tanzania can provide the best praxis of digital inclusion of Africa. (iii)	remote analytics, management of diseases and outbreaks. Safety, food and health will enable people to aim for the higher levels including education, societal engagement, and participation in the society. Furthermore, digital inclusion will open for quality education, empower women and girls, and lead to economic growth, employment and decent work for all. Given the governmental support of connecting the regions, priority is given to (i) extending Internet access to the villages, (ii) creating WiFi hot-spots at health centres, and (iii) the commercial roll-out of Mobile/Internet access. The CTU initiative for Tanzania will create non-discriminating access to information, ensure net-neutrality, and provide a platform for commercial operations both from network providers, ISPs and IT services. Given a close relation to the DDP of the World Bank, we will provide open information on all operations to ensure applicability in other markets, and best praxis for Internet for all, regional ICT markets, e-Government and digital innovation. These principles are the basis for business roll-out, as well as open competence, extendability, and scalability of digital access. The CTU initiative is inviting for partnership in networking, technology, and content to establish Digital Tanzania as showcase for Digital Africa.